rv-pro.com September 2018 • RV PRO • 137 "We have good contacts inside the RV industry today, but we are looking to improve and develop new relationships so we can bring new ideas and solutions to the designers on future product lines," Buraczewski says. "When Sika is included in the beginning stages of future development, that is when our true strength shows in bringing solutions. 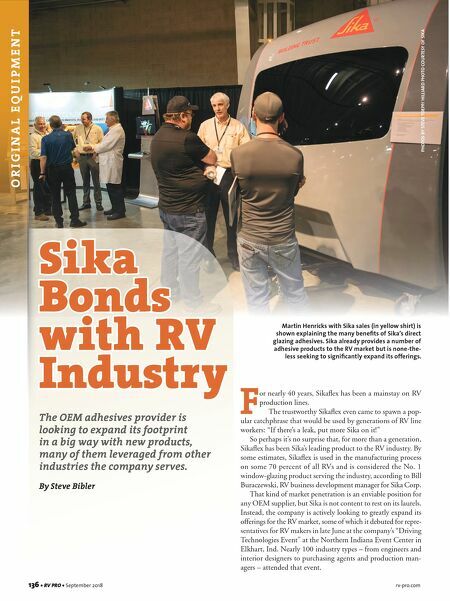 Collaboration between Sika and RV manufacturers is where the biggest benefit will come to help improve the RV industry into the future." Innovations in Flooring, Roofs, Sidewalls & More One of the products Sika debuted to OEMs at its Driving Technologies event is an alternative flooring that Buraczewski says has proven quite successful in the marine industry: Sika's Total Teak Decking System. Sika has pioneered this technology, which it calls SikaFloor, with benefits such as low weight, high noise reduction and thermal insulation. SikaFloor gives the look of teak, but is twice as strong, according to Buraczewski. What's more, it would help OEMs differentiate their products, he says. 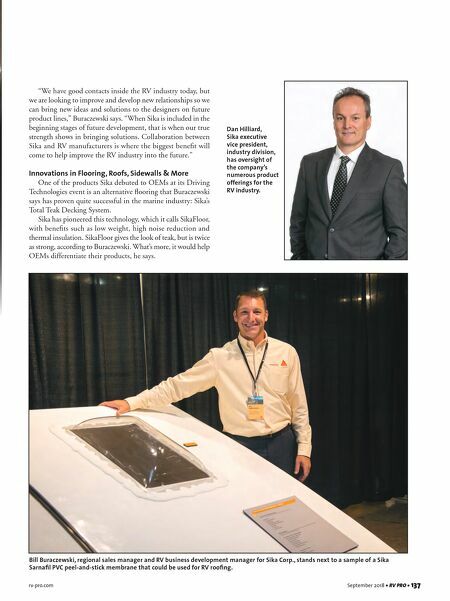 Bill Buraczewski, regional sales manager and RV business development manager for Sika Corp., stands next to a sample of a Sika Sarnafil PVC peel-and-stick membrane that could be used for RV roofing. Dan Hilliard, Sika executive vice president, industry division, has oversight of the company's numerous product offerings for the RV industry.